Dine at the table that sits 16! Living Room - 19'x18' -Feels like a Boat! Lounge with 3 Queen Sleep Futon's with Luxury Queen mattresses. This luxurious estate, boasts an unsurpassed picturesque setting with breathtaking views. The house feels like a boat, designed with views from all rooms but one. This 6000 sq-ft Estate is a gracious oasis of tranquility with mesmerizing views suitable for family vacations, celebrations, reunions & executive corporate retreats. The estate features Living Room, Great Room, Dining Room that seats 16, Four Large Master Bedroom Suites, 2 Large Bonus Rooms, Game Room, Screened in Porch, Roof Top Deck, Gourmet Kitchen, Dining by the pool, Elevator and much more. It has every amenity to truly make your vacation a relaxing and memorable escape. 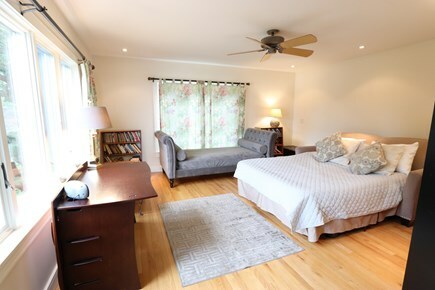 Located in East Orleans, Cape Cod, Massachusetts, with views of Pochet Inlet, Nauset Beach & the Atlantic Ocean. We invite you to contact us to inquire about special rates. If this home is not available for the week that you are interested, we invite you to contact us to view another property on Nauset Beach. For over seventeen years, providing the finest luxury homes to individuals and families. For an additional fee let our Concierge Service schedule your golf or sailing time, arrange dinner or a clambake, or pre-stock the house before your arrival. The property is wheel chair accessible via elevator. There is no better place to enjoy an amazing Cape Cod experience. The house has WiFi and calls within the US are free of charge. Game – 25’x19’ in the lower level with great views of water and door right out to the yard. Have fun playing pool, watching movies on the flat screen TV. Rooftop Deck – 29’x19’ Rooftop Deck with chairs and tables. Spectacular views of pochet inlet and Nauset Beach during the day, and night a great place for stargazing! Contact us for personal chef or gourmet catering packages. Serene and elegantly furnished suites on different house levels, with each offering a sense of privacy. All bedrooms have hardwood floors, ceiling fans and large private baths. Swan Suite – 23’x15’ King, breathtaking water vies from 2 sides, access to upper deck from French doors, sitting area overlooking the water, cathedral ceiling; can be joined to the Great Blue Heron Suite by connecting door, extra large master bath with handicap-accessible WC and multi jet double shower, sunken whirlpool tub, skylight, granite counters with high end fixtures and finishes. Piping Plover Suite -16’x15’ Queen and (2) twin trundle beds, sitting area, en-suite bath with shower, located on the main flower. Lounge – 20’x15’ (3) Queen Sleep Futons with luxury foam mattress, large quiet area near the game room. This room has water views. Additional availability info: Check calendar. Min stay- Jun-Aug - 1 week stay check-in on Sat; May, Sep & Oct 3-7night stay. Additional pricing info: Taxes do not apply for May 2019. 2019 rates reduced to compensate for taxes. Just a few weeks left. State and local taxes of 12.45% will apply. The house is equipped with an elevator giving access to Living, Dining, Kitchen, Screened in Porch, Library, Game Room, Lounge, Seal & Swan Suites, Roof top deck and the Private Pool. We just had a glorious week enjoying the incredible views, the majestic house and pool, and of course the natural beauty of the Cape. We have rented our fair share of properties on the Cape, and this by far was our best experience all around. Even though after seeing the photos our expectations were high, and I am pleased to say they were met and exceeded. The house had everything we needed and the owner couldn't have been more agreeable, helpful and accessible. Highly recommended!! Great family vacation for all ages! We gathered here to celebrate my mom's 80th birthday. We were a total of 16 people that included my 80 yr old mom, my 2 sisters and our families, which included children from the ages of 25 - 10 and one 1 yr-old. The house is just as it is described. The view is magnificent!! As you can imagine, everyone really enjoyed the pool. We also rented a kayak and a canoe, which were delivered and picked up right from the property for a small fee. But you have to watch the tide when you go in the water. We also had a chef (recommended by the owner) come in and cook a surprise surf and turf dinner for my mom's birthday, which she absolutely loved! We loved that we could all sit at the table together for meals. And play bingo and card games at night. The main floor is spacious enough that you never feel cramped or on top of each other. The roof top deck is absolutely stunning! I woke up every morning to catch the sunrise and listen to the birds. It's a great place for a multi-generational vacation. We could cook when we wanted, having 2 of every appliance was great. And we could go out when we wanted. There were plenty of restaurants close by. I think we visited Sundae School almost every night for ice cream. Spectacular oceanfront property with amazing views and heated pool! This is the nicest house we've ever rented, and is perfect for family gatherings. It has everything. The views from throughout the house and the deck and pool area are spectacular. There are two large suites that each have amazing views, and the deck off of the master suite is incredible. There are a number of different gathering areas both inside and out. The heated pool, with automatic cover, is perfect for the whole family. The private dock allowed us to take the kids fishing. We enjoyed watching the two swans come near the property. Our kids enjoyed the billiard table. The kitchen has two refrigerator/freezers, two stoves and two dishwashers, which would be great if someone was having a large party. We spent five days here recently with several family members to celebrate our 50th anniversary. First, I must comment on the view, which is sublime and peaceful, and enjoyed from most rooms. It is the perfect place to relax, meditate or do yoga. Those with a keen eye will notice varied wildlife on the property and across the inlet. The rooftop deck was great for sharing an early morning cup of coffee, a sundowner, and for stargazing. The heated pool was enjoyed by all, since the ocean water was still on the cool side. The elevator is a great convenience for those who have mobility issues, as were the two dishwashers, two refrigerators and the washer and dryers. The screen porch is perfect for a meal anytime. The master-bath shower is a must-try, with all its spray options. The pool table in the lower level provided evening fun. We found the owner pleasant, helpful and accommodating. One big regret….that we couldn’t stay longer. My husband and I, our two children, and their families (twelve in all, with ages spanning from 14 months to 78 years) converged on Blue Waters from NM, CO, and PA, and spent ten days in late June savoring the well-appointed house, the incredible location, and the beauty and ambiance that Cape Cod offers. With a toddler and young children to keep track of, we wanted to be able to enjoy being together at the house without having to travel for our entertainment. Blue Waters was perfect for us! The owner responded promptly to questions and remedied our few minor concerns (such as a delayed recycle pick-up) promptly. With big windows throughout the house, we were treated to an incredibly beautiful view regardless of the weather or time of day. The attractive and comfortable bedrooms allowed the adults their own space while our teens enjoyed the futons in the area off the game room. The two refrigerators, two ovens, and two dishwashers that had sounded like overkill to me when I read the write-up proved to be invaluable, and as promised in the description, the kitchen was well equipped—plenty of dishware, glassware, silverware, and large pots for cooking our lobster dinner and corn on the cob for twelve. Everyone fit comfortably at the table, but perhaps because it was glass, meals still felt reasonably cozy. One would think a heated pool an unnecessary luxury with ocean, bay, and lake swimming so nearby, but the pool added immensely to our enjoyment of our stay. (It seemed to have a salt-water purification system, a pleasant surprise.) On a few occasions, all of us got in the pool and cross-generational water gun fights erupted. But at least some of us, in various combinations, were in the pool everyday. While two or more of us would be out kayaking on Pochet Inlet in the two kayaks we rented, others would be playing in the pool. The kayakers would usually take a swim when they returned and the pre-teens would have been in the pool the whole time. The architecture of this house provides so many environments that there are plenty of quiet spots, and also ample sharing space to gather together. The great room had our favorite jig-saw puzzle table and reading chairs. The heated swimming pool and large deck, with its lovely, breezy, shaded sitting area at one end was a favorite day-time hangout; then some went to the beach in the late afternoons for sand castles and boogey boarding. The elevator allowed my 96yo mom to move around independently with ease. Our favorites: internet access throughout; biking to the beach (courteous and bicycle-aware drivers); spectacular star gazing on the roof deck; feeding the swans; renting kayaks to explore this large and complex inlet; swimming in the heated pool; watching a doe and her fawn feeding across the inlet; bird-watching (humming birds loved the beautiful bushes all around the yard); Cape Cod League baseball games; the peace and tranquility of the inlet. The house is beautiful: soothing color scheme, beautiful light fixtures, open layout of the common areas. A secluded spot was easily found whenever you wanted one. The multiple a/c zones throughout the house were appreciated; mom could keep her suite as warm as she liked! My granddaughters loved their easy access up the outside spiral staircase to the roof deck and their room. The boys enjoyed the billiard room. My son-in-law and granddaughter serenaded us playing the electronic keyboard. The screened-in porch became my husband's man-cave. Those who cooked were delighted with all the cooking and prep space, high quality pots, pans, dishes, serving dishes and utensils. Cleaning up with 2 dishwashers was very quick & easy. Everyone’s least favorite thing: having to go home. What would I do differently? Bring no food or water; pack fewer clothes, and bring more binoculars. There are 2 nearby supermarkets plus several fresh produce & fish markets and bakeries. The highly-rated Zia’s pizza shop even created a dairy-free pizza for us. The house's tap water was very soft and palatable, and the automatic ice cube dispensers were well used. 2 clothes washers/driers = smaller suitcases! Our family reunion with 12 people, allowing my mom to revel in being with most of her great-grandchildren was enhanced and enriched by this beautiful setting. Life is about building memories; this is a great place to do that. This house and its beautiful surroundings will become your definition of paradise. For over eighteen years, providing the finest waterfront luxury homes to individuals and families wishing to vacation and experience Cape Cod. East Orleans is home to the prestigious and well sort after Nauset Beach, Saltwater inlets such as Pleasant Bay and Pochet Inlet and islands, that are a part of the National Seashore of CapeCod. The scenary is never the same. The beach is never the same, nor is the sky that looks upon it. It always presents a new view every day. The sunrises on Nauset Beach and the sunsets on Rock Harbour are spectacular. You can truly soak in the wanders of mother nature, in a town that has worked so hard to preserve the natural beauty, while maintaing the balance. Enjoying golfing on any one of the courses close by. When the piping plovers are not nesting, you can get a permit to take your SUV on certain sections of the beach and enjoy the beauty of mother nature. Many families have fond memories of not only enjoying east orleans in the summer, but not to mention the warm fall, sometimes it is 60 deg on the 1st of Jan. Other sports well enjoyed is biking on CapeCod Bike trail, shell fishing, fishing, boating are just to name a few. The town also has a Theatre Company. It has a quaint village, with it's finest restaurants, Village Market; Ice cream shop; Deli, Pizza places. Easy access to fresh sea food; produce; Gourmet restaurants and most importantly the #1 bakery on Cape Cod, The Cottage Street Bakery. You also have access to large commercial grocery stores.